I got elastic cord for .79/yard at JoAnn, and it took about 25 inches each for the gray sneakers and about 18 inches each for the black (because I threaded them differently–the knot is hidden behind one of the eyelets). This particular elastic’s not terribly stretchy, so I had to leave it laced somewhat loosely for Rose to get the shoes on easily. Rose likes them (even if she was not willing to stop chewing jelly beans long enough for me to take a photo). And I feel clever. Update: My husband tells me he saw elastic shoelaces in colors at a shoe store the other day. 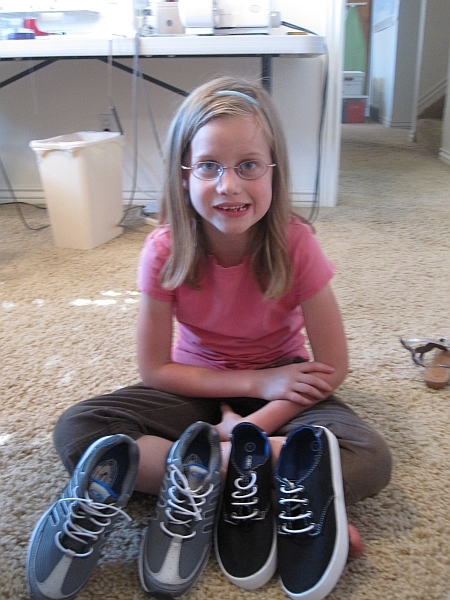 Also, he used 1/2″ flat elastic to replicate the look of some wide laces on some shoes for our six-year old (but it was pretty hard to thread it through the eyelets). This entry was posted in Creative miscellany, Tutorial. Bookmark the permalink. You are clever. I need to do this with my kids’ shoes! I tried that once, but I found it a pain to adjust it right. 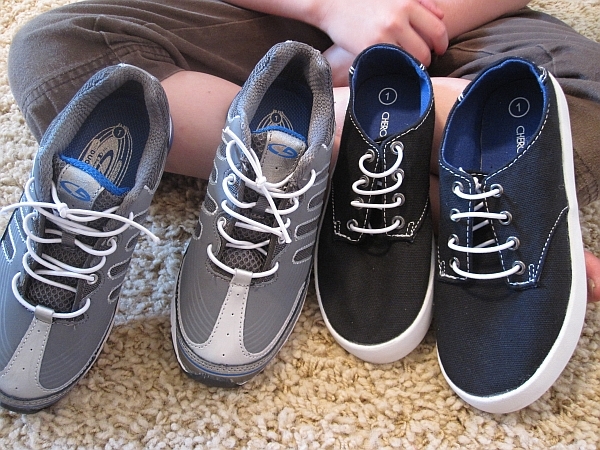 Instead, I settled with using a permanent knot with normal laces configured for a fairly loose fit. The knot looks like a normal knot and has the advantage of keeping shallow people quiet. Shallow people who can’t mind their own business is why the Velcro fad faded nearly as soon it emerged.